Tin Hau, also know as "Mazu," "Tian Fei" or "A-Ma" is an indigenous goddess of the sea meant to protect fishermen and sailors. She has become a patron deity of Southern Chinese and East Asian persons. This is reflected in the widespread worship of Tin Hau in the south-eastern coastal areas of China and neighboring regions of Southeast Asia. These tend to be communities with strong seafaring traditions. While she is depicted wearing a red robe in paintings or murals, in sculptures Tin Hau is clothed in the jewel-encrusted robes of an empress; she also tends to hold a ceremonial tablet or embellished staff and dons a flat-topped imperial cap. In relation to this "imperial" depiction, she is often shown sitting on a throne; this reflects her becoming an empress-like figure during the Yuan dynasty. In addition to her own physical appearance, Tin Hau is usually paired with two guardian generals known as "Thousand Miles Eye" and "With-the-Wind Ear." Though their iconography can vary, they are usually painted as demons, for they are two demons that Mazu defeated and conquered. Before she was deemed a deity, Tin Hau was the human Lin Moniang, born on March 23, 960 in Fujian province as the seventh daughter of a fishing family. 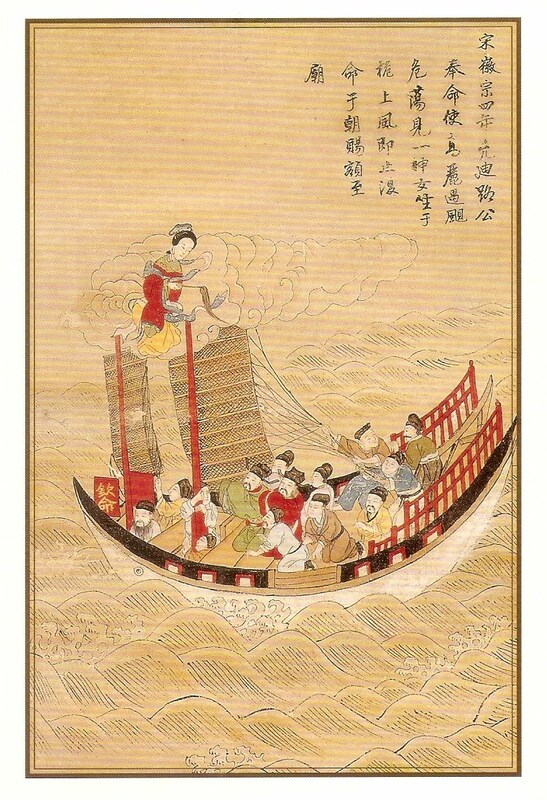 According to legend, both her father and her brothers were fishermen and were put in danger when one day a typhoon arose while they were out at sea. It seemed inevitable that they had perished in the storm. However, in the midst of the disaster, she is said to have fallen into a trance while praying for their lives (or alternately that she dreamed of them while sleeping or sitting at a loom). While her father and brother(s) were drowning, her mother found her sleeping and attempted to wake her. This disturbance distracted her, causing her to drop her brother; he drowned as a result. Saved, her father returned to tell the other villagers of this miracle at sea. After her death (in one version she dies at the age of 28 while climbing a mountain and flies to heaven as a goddess; in the other she dies at 16 of exhaustion while swimming far into the sea to find her father), the families of many fishermen and sailors began to pray to her in honor of her courageous acts. Worship of Tin Hau spread quickly and soon she was integrated into the Taoist pantheon. Much of her appeal comes from her role as a compassionate and motherly protector, unlike the more authoritarian Taoist father figures (i.e. Dragon Kings). She is unique in being simultaneously authoritative and compassionate (Irwin). In Hong Kong, there are approximately 80 Tin Hau temples. Her significance in the area has led to many of these temples becoming graded historic buildings. Discussion of "Tin Hau: Patron Goddess of the Sea"
Version 8 id 47972 of this page, updated 02 July 2013 by Kelly Belter. Created by Kelly Belter. How to Know Hong Kong and Macau by Roberto Ignacio Diaz and Dominic Cheung and Ana Paulina Lee. Help reading this book.